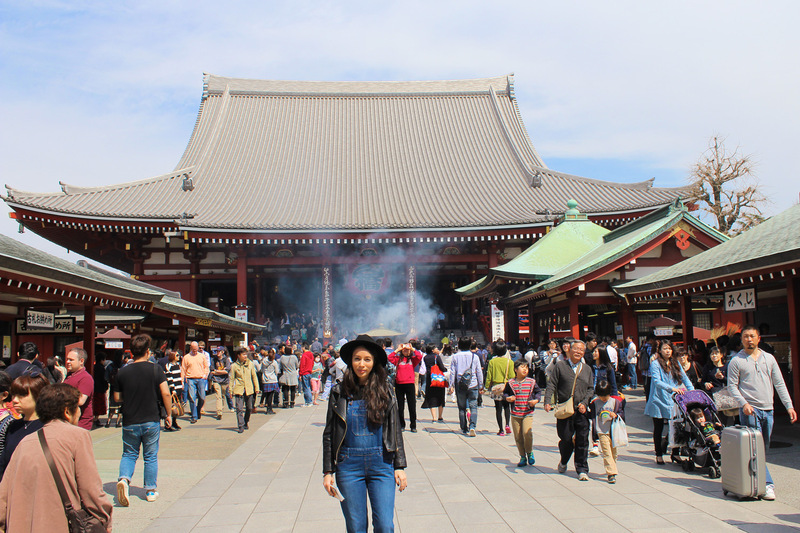 Japanese social rules can be intimidating to many first-time visitors. And no wonder! Japan’s 5.000-year old civilization has developed a very complex code of etiquette and customs. But don’t panic—with a little study, you can easily get a handle on the basic rules of the Japanese social code. You’ll be pleased to know, however, that Japanese folks are generally pretty forgiving when it comes to visitors making a mess of things in the etiquette department. Before my trip to Japan, I read many books about customs and manners in order to prepare myself, and now I would love to share what I’ve learnt. So, from respectful forms of greeting, to chopstick faux pas, here’s your Survival Guide to Japanese Etiquette & Customs. Knowing how to say hi in Japanese is essential for enjoying your trip. Knowing a little Japanese not only will bring a few smiles, but it also shows respect and an interest in the local culture. Konnichiwa – pronounced “kon-nee-chee-wah” – it is used as a respectful-yet-generic way to say hello until sundown. Some other basic Japanese greetings are: Ohayou gozaimasu (oh-hi-oh goh-zai-mas) for good morning, Konbanwa (kon-bahn-wah) for good evening and Oyasumi nasai (oy-yah-sue-mee nah-sigh) for good night (a more casual way to say it is Oyasumi). Also, a quick way to introduce yourself is to say “Hajimemashite! Watashi wa (name) desu” which translates to “Nice to meet you! I am (name)” . 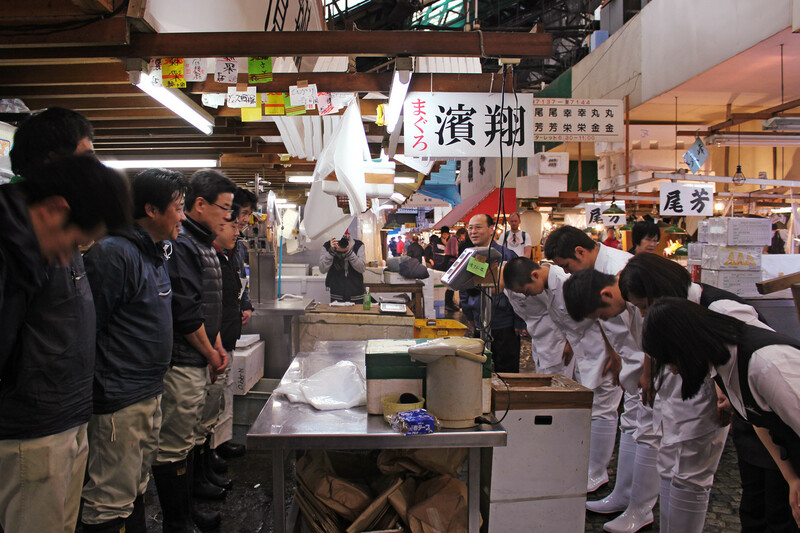 Customarily, when Japanese meet, express thanks or say goodbye, they bow to each other instead of shaking hands. The depth of the bow depends on the relative status of the two individuals and their relationship. Foreigners aren’t really expected to bow – unless they are lucky enough to meet the Emperor – but it’s terribly contagious, and you’ll soon find yourself bobbing with the best of them! Japanese more familiar with Western customs may offer you a hand to shake, in which case treat it gently – they won’t be expecting a firm grip. 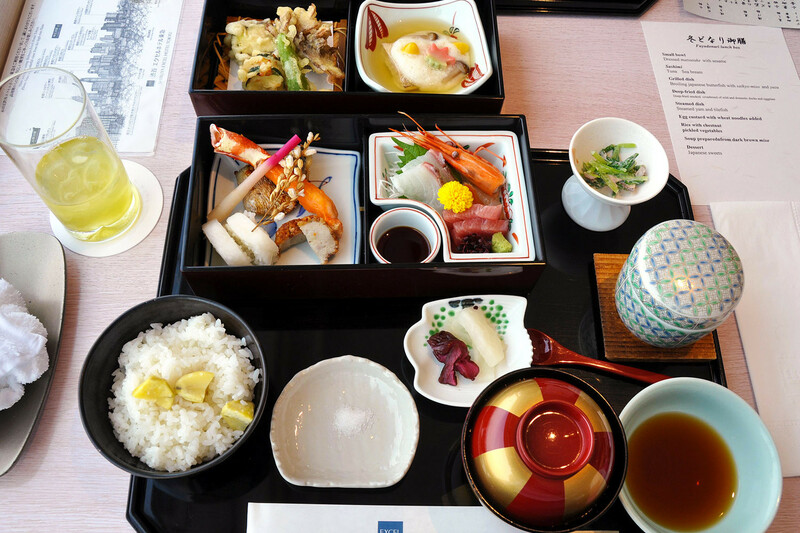 There are several things you can do when eating Japanese food to communicate respect and gratitude for the food and drink. The good news is that Japanese people love to eat, so this could be a great opportunity to show off your chopstick skills! Hold your chopsticks correctly. Easier said then done, right? This part takes some time to master and if you really want to learn you should get as much practice as possible. Don’t play with your chopsticks. Do not wave them around over food on the table, or point them at someone while talking, or point to indicate dishes you think are particularly delicious. Don’t eat directly from common dishes. Instead, take the food from the shared dishes and place it on your own plate or bowl before eating it. Never, ever, ever, pass food with your chopsticks. Doing so reminds Japanese of the ritual of passing cremated bones between chopsticks at funerals. The same rule applies to sticking your chopsticks into a bowl of rice vertically — another morbid symbol. Many restaurants in Japan will provide you with a moist towel, known as an “oshibori“, that’s either cool or hot depending on the season. These are used to lightly clean your hands before a meal and it’s definitely rude to clean your face with them or to continue using them as a napkin. Do not dump soy sauce directly on your food, especially plain rice; instead, pour a small amount of soy sauce into a bowl and dip your food into it. Mixing other food with rice is usually not done. You eat a bit of one and then a bit of the other, but they should never be mixed together as you do in many Western countries. Drink the miso soup out of the bowl as if it were a cup, and fish out the solid food pieces with your chopsticks. In case of noodle soups, be careful of splashing the noodles back into the liquid. If a ceramic spoon is provided, use it, otherwise, you can drink directly from the bowl. Slurping noodles or making loud noises while eating is surprisingly OK! In fact, slurping hot food like ramen is polite, to show you are enjoying it. It is good manners to clean your plate to the last grain of rice – never waste food that you have put on your plate! Say “gochisosama-deshita” when you’re finished eating. This means “it was quite a feast”, and is a way of thanking whoever provided your food. It’s especially gratifying to hear when you’re the one who cooked it, so make a point of saying it. If you ate with disposable chopsticks, place them neatly back inside of the small bag and fold the end. Otherwise, leave them sideways on your plate. If eating in a restaurant, place your money on the small tray provided rather than handing it to the server or register attendant. If no tray is present, use both hands to give your money and receive the change. Tipping is NOT common and to tip someone is actually insulting: the services you’ve asked for are covered by the price given, so why pay more? Meals are often accompanied with drinks, either beer or sake – don’t drink alone! If you’re with a dinner party and receive drinks, wait before raising the glass to your lips. Everyone will be served, then someone will take the lead, raise his drink, and yell “kampai!” (cheers). At dinner parties, it’s somewhat rude to pour your own drink. Instead pour everyone’s drink but your own and someone will notice and fill yours. It’s popular to order shared bottles of beer and sake because this routine is one of the charms of an evening. Japanese Shinto shrines and Buddhist temples are one type of sightseeing spot that attract a great deal of tourists from abroad, and are also places that have been treasured by the Japanese people since days of old. It is worth it to take a moment to learn the correct way to enjoy a trip to some of these wonderful places. Pass through the torii gate. All shrines have a torii gate, which is the boundary line between holy ground and the secular world. Passing through the torii gate signifies that you have stepped into the domain of the deity. Though awareness of torii etiquette has dwindled recently, bowing once in front of the torii gate is the correct procedure. Purify your hands and mouth at the “temizuya” water pavilion. Take one of the ladles provided, fill it with fresh water and rinse both hands. Then transfer some water into your cupped hand, rinse your mouth and spit the water beside the fountain. You are NOT supposed to transfer the water directly from the ladle into your mouth or swallow the water. At the offering hall, throw a coin into the offering box, bow deeply twice, clap your hands twice, bow deeply once more and pray for a few seconds. If there is some type of gong, use it before praying in order to get the kami’s attention. Temples do not have any one procedure for visiting that is as strict as shrines, but you still need to behave calmly and respectfully, of course. 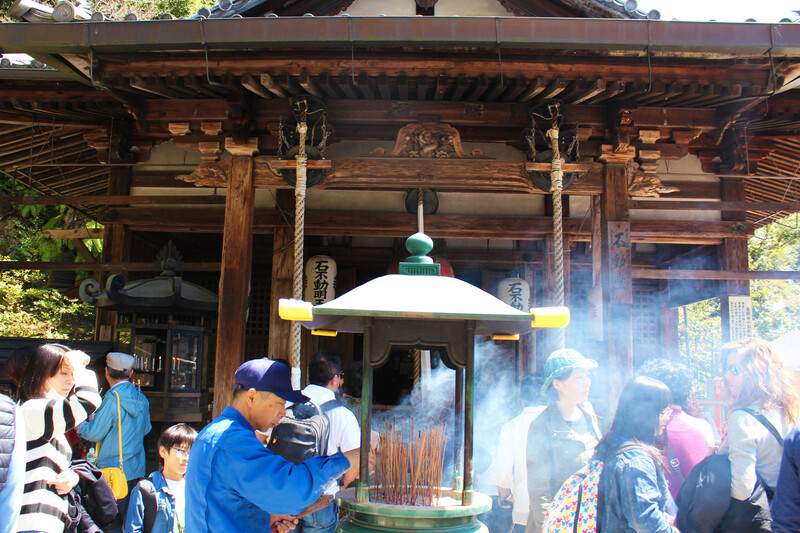 At some temples, visitors burn incense – “osenko“ – in large incense burners. Purchase a bundle, light them, let them burn for a few seconds and then extinguish the flame by waving your hand rather than by blowing it out. Finally, put the incense into the incense burner and fan some smoke towards yourself, as the smoke is believed to have healing power. You may be required to take off your shoes when entering temple buildings. Leave your shoes on the shelves at the entrance or take them with you in plastic bags provided at some temples. Photography is usually permitted on the temple grounds, but it is forbidden indoors at some temples. These rules not only apply to most Japanese homes, but also to many traditional ryokan, some restaurants and the indoor sections of many temples, castles and other historic buildings. First of all, it is polite to say ”Excuse me I’m going inside” (Ojyamashimasu), before you walk in and say ”Thank you for having me in” (Ojyamashimashita), when you leave. The border between inside and outside is not the door itself, but the entrance area, called genkan. It is still considered outside and is the place for people to take off and put their shoes. In contrast, the indoor space is typically elevated and covered by a different type of flooring than the genkan. Slippers are provided by the host. If you are not wearing socks, it is considered polite to bring a fresh pair of socks to wear after removing your outdoor footwear. Slippers can generally be worn anywhere indoors except when entering rooms with tatami floor. Tatami should only be stepped on with socks or in bare feet. 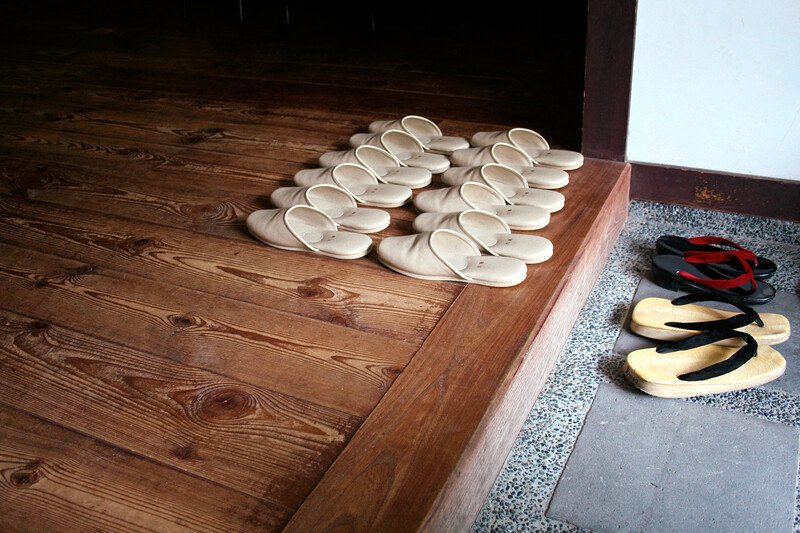 Remove your slippers before stepping onto tatami and place them neatly outside the tatami room. Separate toilet slippers are often provided for use inside washrooms. The regular slippers are left outside the door when using the washroom. Don’t forget to remove your toilet slippers after usage, a common faux pas among foreign travelers. Blow your nose in public. Always excuse yourself to a quiet corner or the bathroom. Seriously, it’s a big no-no in Japan! Eat in public whilst walking. There are a lot of restaurants that serve food on the street, but you are supposed to eat it right there, on the spot, instead of walking away with it. Probably the only exception is ice cream. Talk on the phone on any public transportation. Instead, type. Point your finger or chopsticks at people. If you have to indicate an object or direction to someone, wave your fingers with the palm downwards. Mishandling someone’s business card. It’s not only in formal business situations that someone might offer you their card, but it could happen whenever and wherever. Taking it with both hands looks good, and spending a little time showing an interest in it is a real plus. Here’s one last tip: don’t be embarrassed if you don’t know something. Just ask nicely, as the Japanese will understand that you acknowledge their culture is different and that you are interested to learn the rules. You will find them amazingly warm and open if you’ll simply make an effort to bridge the gap. And now congratulations! You’re ready for the trip of a lifetime! Have you already embarrassed yourself terribly in Japan? Tell me about it in the comments! Get Green and Turquoise posts and updates emailed directly to your Inbox.